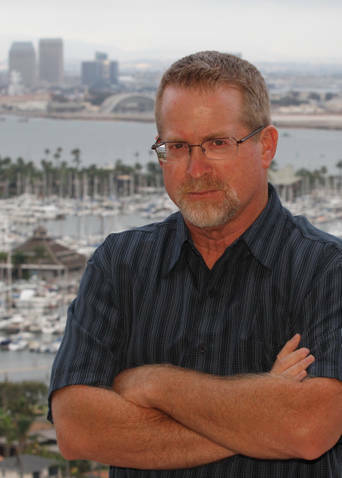 What: His debut novel, YESTERDAY’S ECHO, won the Anthony Award for Best First Novel, the San Diego Book Award for Best Mystery, and the Ben Franklin Silver Award for Best New Voice in Fiction. 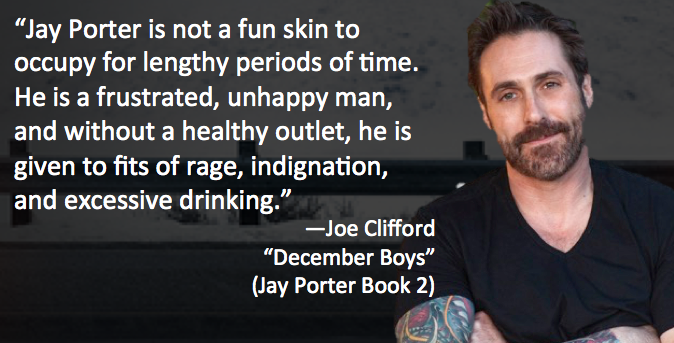 His second book, NIGHT TREMORS, was named a top pick for 2015 by Bookreporter.com. 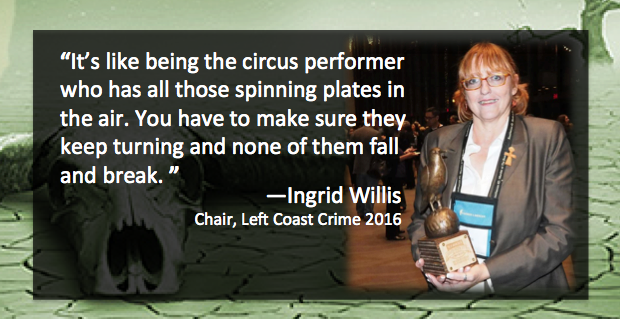 and was a Lefty, Shamus, and Anthony Award Finalist. DARK FISSURES, is the third book in the Rick Cahill crime series. Congrats on publishing your latest Rick Cahill novel, DARK FISSURES. How did the concept for this one come about? 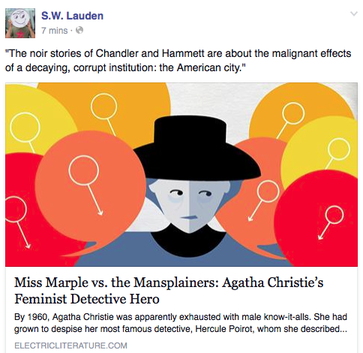 The idea for the book came to me late in the “I need a story for my next book” process. I’d gone through a lot of what if scenarios and hadn’t come up with anything that resonated. Late in the process, I happened to be reading about the death of two former Navy SEALs overseas who were working for Global Response Solutions. Among other things, GRS hires out for security to the CIA. I wondered what these former elite soldiers would do for work after they returned home to the States. Law enforcement made sense. Then I wondered what Rick would do if he was hired to investigate the suicide of these former SEALs. 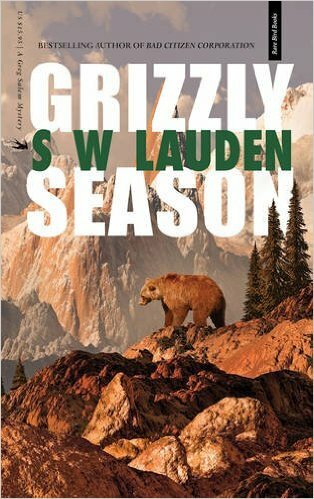 This entry was tagged Dark Fissures, Lefty Anthony Award, Matt Coyle, Night Tremors, Oceanview PUblishing, Rick Cahill, San Diego Book Award, Shamus, Yesterday's Echo. Bookmark the permalink. Today marks the release of “Night Tremors,” the second Rick Cahill novel from Anthony Award-winner Matt Coyle. 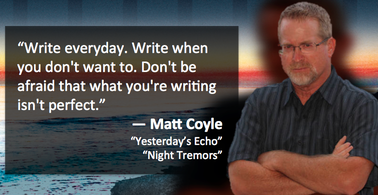 I was lucky enough to interview the author earlier this month about “Night Tremors” and his debut novel, “Yesterday’s Echo.” He had a lot of interesting things to say about his road to writing and publishing an award-winning novel, and about his writing process in general. YESTERDAY’S ECHO won the Anthony Award for Best First Novel in 2014, in addition to other awards. Given the many accolades, were you tempted to wait another 30 years to write the follow-up? Did you feel any pressure—external or internal—to avoid the so-called “sophomore slump”? I’m always tempted to wait instead of writing. It’s so much easier. I never felt any external pressure to not write a crappy second novel. My agent and publisher are incredibly supportive. However, there’s always internal pressure, fear, and insecurity when it comes to writing. I wrote and rewrote YESTERDAY’S ECHO for ten years, getting it as close as I could to where I wanted it to be. I emptied my soul into it. When I starting writing NIGHT TREMORS, I didn’t know if I had any soul left. Luckily, I figured out that Rick had changed through his ordeals in the first book and I found fresh material in learning how he would deal with his new circumstances and new challenges. The second Rick Cahill novel, NIGHT TREMORS, comes out on June 2. How has the character evolved since we last saw him? What can readers expect from the new novel? Rick made decisions and took actions in YESTERDAY’S ECHO that had consequences, both externally and internally. They changed him. Damaged him. Gave him a slightly harder shell. But underneath he’s still the guy who wants to do the right thing, only on his terms. In the beginning of NIGHT TREMORS Rick is working for a large investigative firm in La Jolla and making more money than he ever has. He just bought his first home, but the work doesn’t feed his soul. When the opportunity to help free a man who’d possibly been wrongly imprisoned, Rick grabs it. However, in doing so he risks losing his home, his job, his freedom, and even his life. Ultimately, he’ll have to make the most difficult decision of his life. You can read the whole interview right HERE. Pick up your copy of “Night Tremors” right HERE. This entry was tagged #amreading, #amwriting, #qanda, #writing, interview, Matt Coyle, Night Tremors, Oceanview PUblishing, publishing, Q and A, Rick Cahill, San Diego, Santa Barbara, Yesterday's Echo. Bookmark the permalink. This entry was tagged #amreading, #amwriting, #writetips, #writing, #writingtips, Alice Bolin, Amelia Gray, Delilah S. Dawson, Duff McKagan, Electric LIterature, fiction, interview, Jim Ruland, Lit Hub, Matt Coyle, Nathan McNamara, Publishers Weekly, publishing, Q and A, whimsy dark. Bookmark the permalink. What: Matt Coyle has a degree in English from UC Santa Barbara. He’s taken detours into the restaurant, golf, and sports collectible businesses. 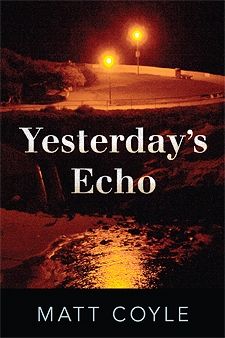 His first novel, YESTERDAY’S ECHO, won the Anthony Award for Best First Novel, the San Diego Book Award for Best Mystery, and the Ben Franklin Silver Award. 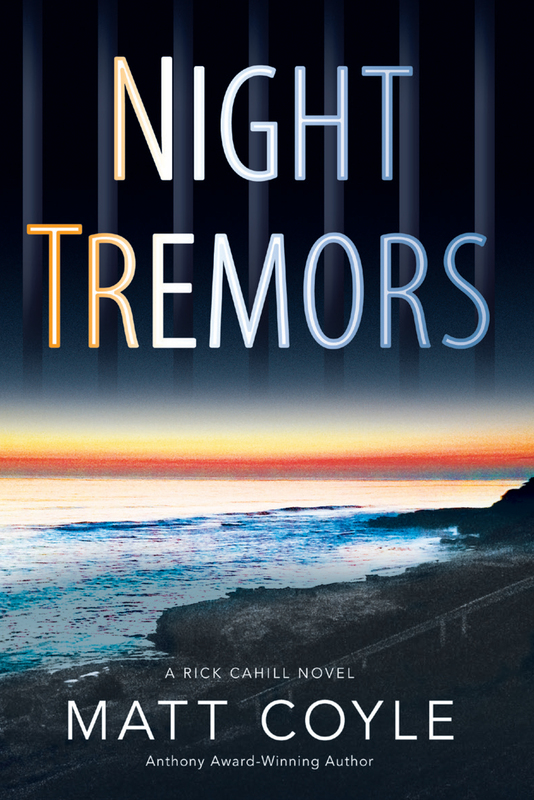 NIGHT TREMORS is Matt’s second novel in the Rick Cahill crime series. Matt lives in San Diego with his Yellow Lab, Angus. Interview conducted by email. Some questions/answers have been edited. You set out to write the “great American novel” after college, but didn’t publish your first book until thirty years later. How did your publishing dreams and writing style change over the course of three decades? First of all, thanks for having me. I think dreams is a great choice of words because my preparation and expectations were unrealistic when I first started writing. First of all, I had to get off my rear end and consistently write. That took about twenty years to figure out. Then I thought writing was a completely solitary endeavor: You write in a cocoon without outside intervention because it’s your story. How could anyone else have anything to add to it? Once I finally had a first draft done, I thought, “Okay, time to find an agent, sign a big book deal and quit my day job forever.” Hard knocks taught me that the life of a writer is quite different than my dreams. My writing style evolved as it had to for me to have any chance of getting published. I took novel classes at UC San Diego Extension and joined writers groups. I broke out of the cocoon and realized that readers my not be reading the story I thought I was writing. Plus, I starting writing in first person and found the voice of my protagonist, Rick Cahill. That changed everything. 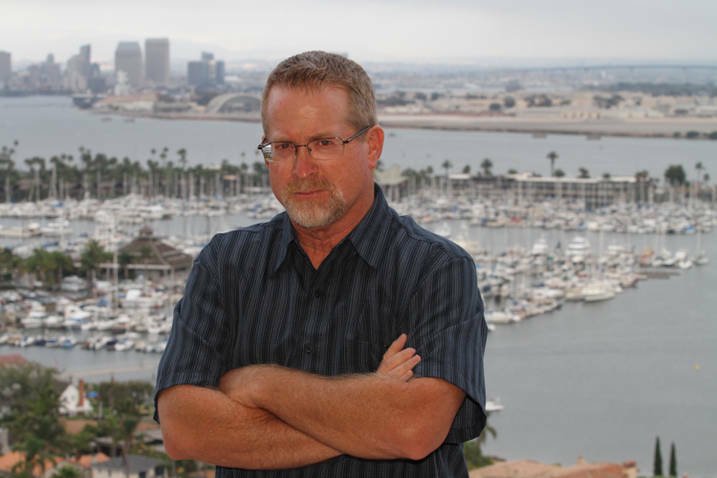 This entry was tagged #amreading, #amwriting, #author, #authors, #genrefiction, #Noir, #Q&A, #writetip, #writing, #writingtips, Anthony Award, interview, Matt Coyle, Rick Cahill, San Diego, Santa Barbara. Bookmark the permalink.